Certainly not every adventure needs the stereotypical adventure soundtrack treatment: the booming drums, the power chords, the adrenaline and triumph poured on like a cologne shower. Sure, there are moments like that, but there are also slow days, and boring days, and days when you get lost, and days when monkeys steal your food, and days when snakes invade your camp, and days when you get really homesick. So it's nice to have an adventure album that captures a more realistic range of emotions. 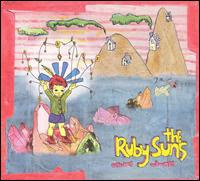 Sea Lion, the second by New Zealanders The Ruby Suns, has its roots in frontman Ryan McPhun's intercontinental travels. Full of chants, hand drums, clapping and clacking, as well as standard rock instrumentation, Sea Lion pairs Western styles with African ones. On the jubilant "Tane Mahuta," McPhun conveys the communal aspect of the chants, welcoming a chorus of voices. As he writes in the liner notes, "a lot of people sang on Tane Mahuta -- too many to list." This is definitely his journey, though. For much of the album, he alone sings, and the echoey overdubs magnify his wistfulness. It might do Brian Wilson proud, particularly "Remember," which even uses some beach iconography: "Imagine yourself on a wave / riding all the way in / imagine yourself in a dream / seeing all your old friends." Was one of those friends an elephant? "Ole Rinka" stirs from its nest of bells, the murmur of field recordings and twitter of tropical birds giving way to a simple chorus in awe of nature, "The elephant eats the leaves / the elephant eats the leaves." What follows can only be pure and wordless emotion: "Oh-aaah-ahh-ahh / oh-oh-ahh-ahhh." Several of Sea Lion's songs include sections distinct from what each began with, as if split into parts. "Adventure Tour" zings with autoharp as McPhun recalls driving through a rainstorm. A change-up of guitar signals the end of that chapter, introducing a new tempo, but this lasts no more than a minute. The song ostensibly ends, dissolving into pops and suction, but wait -- a swell of voices fills the air, bleeding into the next song. In this way, the songs imitate memories themselves: blurring with time, even if time makes them fonder.